How does Google rank my SEO? Each month there are more than 100 billion global searches being made and 75% of users do not go past the first page of Google. Google has spent billions of dollars to place themselves solely at the top as the search king. They account for more search and more traffic than all other search engines combined. They are the gatekeepers between you and your potential clients. So when it comes down to it, we care what Google thinks of my website’s SEO. SEO is more than keywords and meta tags. SEO is definitely not new, but more and more businesses are beginning to understand it’s value. Business of all kinds are investing in ways to get on Google’s first page. To bad many of them of them are still investing in how Google used to work. The old concept of SEO was putting lots of keywords on a page and finding ways to hide more keywords in meta-tags. The idea is that you can trick Google into thinking your website is the best source for say “tires” by saying tire as many times on the page as you can. Not only does it make pages look spammy, it doesn’t add value to searchers. Why? Because they are the lifeblood of what makes Google relevant and profitable. When people use Google and find exactly what they want they will use Google again. Google has been the driving factor in creating search centered society. With all the habitual traffic now Google can come to us business owners and sell off their well earned traffic. What is SEO to Google? Trust. It’s trust. Google wants to find the most trustworthy site for searchers to find exactly what they need as quickly as possible. That’s why it’s not just about stuffing as many keywords as possible in a page. It about having great content that people really need that is tried and true. So what are the ranking factors for Google? Social media is not new in “technology years” and we know that social media has an impact on ranking, because Google is tracking it. Specifically, it’s tracking it with Google +. So it’s there, but it’s still uncertain the impact. The difficulty in Google making this a major factor is that websites that have ranked well for many many years don’t need social engagement to prove their value. So while the jury is still out, know that people sharing your content from your page matters and it is sure to matter more and more. Is your website hosted by GoDaddy? It may the a really simple option. There are a lot of these simple and easy website registration and hosting options. But look at it from Google’s perspective. These sites can pop up so easily and can easily just become dead web space. So obviously they are going to trust a site that is registered and hosted by a unique and reputable web-host. What happens when Google comes to your site 5 times and you don’t have any new content? They reallocate their resources! But if every time their bots search your site you have new good content, they are sure to reward you. It’s truly about trust and your active and growing site is a great way to show Google that you and your site are serious. Are you familiar with the term Bounce Rate? Bounce rate is the percentage of visitors who come to your website and leave without viewing any other pages. This is sign that people aren’t finding what they want from your website. Google is able to track these types of site engagement and they can use it measure how happy visitors are when they come to your site. It can be frustrating to deal with high bounce rates and low on page time, but it’s great to know how your can improve your site for your visitors. 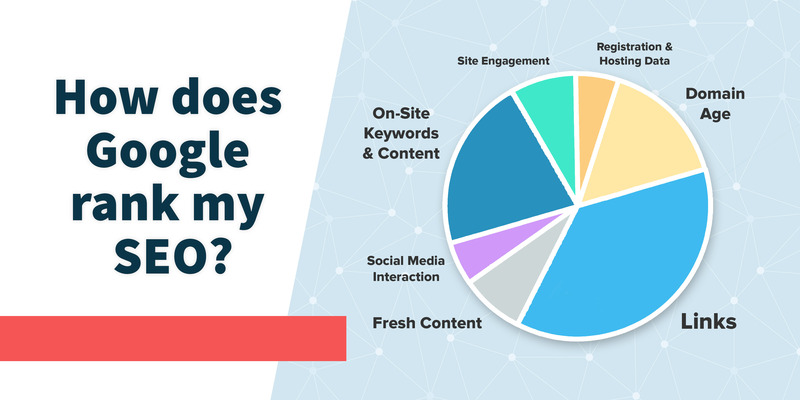 Most people only think of SEO as keywords on pages, but even though it is a lot more complicated than that it’s still the core of a good ranking strategy. Don’t pack in tons of keywords though because you think you can hack Google though. It’s most likely that Google will see what you are doing and value your competitors site that is readable and offers the best content to meet the needs of visitors. There are a few ranking factors that you have control of. You can control how much content you create and how you implement keywords organically in your page. But still the second most important ranking factor is how old your domain is. This can be frustrating for a new site, but honestly this is great. When you have put in the time and years of building your SEO, you want to know that some new site can’t just pop up with a bunch of words on a page and a great layout and outrank you. Domain age shows Google that you have been around for years and odds are you will be around years more. Links are the reason why is called the world wide web. It is a huge cyber world of roadways from sites to other sites. When you look at your site are their hundreds of roads that lead there or just a few? Are they superhighways or old country roads? Links are the number 1 factor for ranking. It makes sense if you think about it. Links means that not only do you have a site you think is awesome, but the rest of web sees your site and finds value in it by connecting with it. 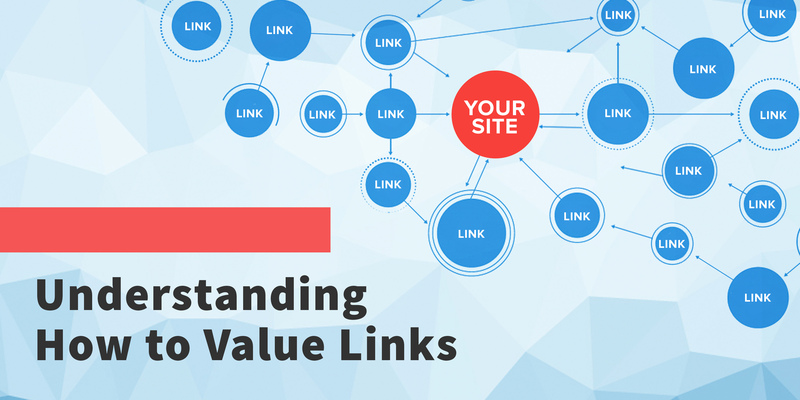 There are many different types of links that have different values. Don’t fake it with black hat link buying strategies. Google will most likely not only not value it, they may punish you. Create great content that is sharable. Be consistent across other sites that are relevant to your and your visitors. They are hard earned, but the payoff it worth it when your visitors become clients. If you’ve ventured into SEO at any depth, you’ve come across the concepts of backlinks and link building. Search engines crawl almost unimaginable amounts of sites and content. Understanding how they read the content is one thing, but understanding how they ascribe value to is another thing all together. Probably the most simple way to understand it is through links. Links are the roads between pages and how search engines understand the relationship between pages. We really have to look at how search engine evaluate links. And while we can’t completely understand the insanely complex and patented metrics that search engines like Google, Firefox and Safari use, we can look at years of experience, real-world testing and analysis to come up with a list of meaningful factors. The root of understanding links is that it equals trust. We are find the signs that point back to Google proving your site and pages are authentic and authoritative. This one is easy enough. The more popular your site is the more links it will have. Sites like ESPN and Wikipedia have millions of sites linking to it because of quality content that people read and share. While most of us will not be dealing with backlinks in the millions, over time you can accumulate links through linking partners and sharable content. “Local” is a newer idea that has be added to the equation and it’s important. For most services, traffic is really looking for someone local. It doesn’t help to find a roofing business in Spokane if you live in the Tampa. This is good, because you aren’t competing with everyone in the world. Local links help build authenticity. They know you are who you say you are because the people around you confirm it. That same is true for topic specific links. If you are a gun shop, it looks better that your info is also on the NRA’s site and not on HGTV. A great signal for engines to use are is anchor text. If many of your links all use the correct keywords, it is very likely that you will rank well for those keywords. It is one more important layer for search engines to consider. The next level gets to the heart of link building. Not all links are equal. More than half of the internet is just pure spam and dead pages. Search engines have to weed through all the muck to get to relevant and trustworthy content. There are ranking measurements like Domain Authority, Page Authority and Local Score that can help you understand. In the same way you are trying to build authority for your site, the sites you want links from needs to be authoritative. Fewer links from established sites are better than many links from blog networks and retweets from fake Pakistani twitter accounts. Links decay over time. Many sites that used to dominate the web have now become old news. Search engines can tell when you got the links and if you are continuing to get them. Continuing to get consistent links show that you are still in active in the game and you should be rewarded. Social has really changed everything. Content is no longer just designed to be read but shared too. It’s important to note that search engines treat the content in a different way and it’s still hard to know how it factors into the search algorithms. But social media is really denying that there is a rising importance of social engagement with your content. Does your business depend on local customers to drive sales? If so, then it is absolutely crucial that your business create an online presence which makes them visible to local customers who are looking for them. Those that do will see the difference in their sales. Those that don’t will not — and will be drowned out by their competition. First, we’ll discuss what it means to create a local marketing strategy and how you can get in front of customers in your area who are looking for your services. We’ll also discuss how customers currently find goods and services, and what that means for your business. Most importantly, we’ll explain how local marketing is essential for a successful, competitive business. It’s a must, not just a maybe. Word-of-mouth marketing is still powerful. It may be slow, but it still works. And if you see a billboard or a store when driving by that interests you, you’re likely to buy. The problem still is ease of access. You can’t click on a billboard to get more information, and you certainly don’t have enough time to write down the phone number while driving. Newspaper ads have become far less effective because readership of newspapers has dropped steadily over the past decade, and newspapers reported 5% less ad revenue from 2009 to 2014. With the advent of technology and younger generations getting their news from digital sources, the readership of print newspapers has steadily aged, to the point where the only age group in which over 50% of people read newspapers on a daily basis is 65 and up. The fifth option, TV and radio spots, is still used, but is very expensive – and does absolutely nothing to get in front of a customer when they need you right now. How often when watching TV or listening to the radio do you sit and listen to commercials? For most, it’s never. We either watch shows on demand or change the channel/station to something else. Now, what do all five of these methods have in common? They’re all reactive. They push out information instead of pull it in. You’re pay a lot of money to advertise to everyone when only a few will actually purchase. According to BrightLocal.com, 91% of all consumers said they have used the Internet to find a local business, a 13% increase from 2010 to 2015. 43% of consumers use the Internet to search for a local business just once a month, 38% increase from 2014. Better yet: 80% of consumers trust online reviews more than personal recommendations. If you’re thinking, “That doesn’t necessarily mean they’re buying locally,” you’d be wrong. One survey found that 78% of local searches on mobile resulted in offline purchases – and that number was from 2 years ago. The bottom line is this: the Internet is the main way customers find local businesses today. If you’re visible online, you will get new business. If you’re invisible, you’ll lose your competition wins. So how do you create a strong local marketing presence? A funny thing happened in Birmingham, AL which perfectly illustrates the importance of local optimization. A restaurant called Surin of Thailand never built their online presence, as a result, Google pulled the information which it found to be relevant for that business. Turns out though, when you Googled the address, a picture from Facebook of a unrelated woman populated Google. She was the first thing you saw. As funny as this may be to the lay person, this is frightening news for a business owner. In order to understand why this happened, you first must understand how Google knows about your business. Google is collecting information about local businesses from anywhere it can. But that isn’t limited to only the profile you created for your business. Any amount of information is fair game, and if you’re anything like most businesses out there, much of that information is incorrect. You could have changed or added locations, changed your phone number, or even the information itself could be wrong. 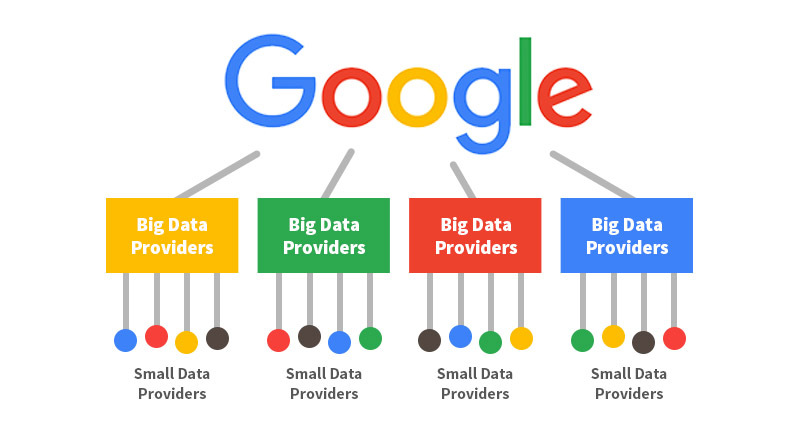 Google buys data from big data providers, who in turn buy data from smaller data providers. If those providers have incorrect information, they’ll report it to Google, and no one will ever know the difference. If these methods can’t be relied on to consistently grow revenue, how do you market your local business? The simple answer is this: consumers take action themselves to find businesses when they are ready to buy, and that largely means searching the Internet. Enter local search engine optimization, or local SEO. Local search optimization checks your information online by making sure essentials like – name, address, and phone number is correct on several different online directories. This way, when these providers scrape your data and sell it to Google, they’re giving Google consistent information across the board. This information is then correctly displayed, and positively impacts your search ranking. If your information is inconsistent, the less Google likes you and the lower your ranking. For a local business, this is absolutely necessary. Not only do you need to be visible, but you need high enough rankings so consumers choose you over your competition. Local search optimization is only the beginning, though. It’s a good foundation, but there are many steps to insure your business has a strong presence. Content was once the most important aspect of your website. Now it’s mobile search – and its importance is growing exponentially. More people are now using mobile devices to find anyone or anything – especially local companies. According to a Google report from 2015, more people search on mobile devices than they do desktops or laptops. If your website or strategy aren’t mobile-friendly, you’ll drop in rankings. Your website has to display it’s content relative to the device. This means text must be legible, and buttons/links need to be easily ‘clicked’. If you’re like me and you’ve been to a website which isn’t mobile friendly, you immediately leave the site. This can lead to not only poor reviews, be more importantly, decreased sales. When you search Google, you’ll notice the ‘three-pack’, or the top three results for a business. But if you look closely, what you don’t see are phone numbers or addresses. But one thing that is there – and is very prominent – is the review section. Google displays all the reviews that it can find for your business — and the mechanics are simple: companies that have more reviews perform better than those that don’t. Those that have good reviews perform better than those who don’t. You can see why it’s so important to have as many reviews as possible, but don’t neglect Google reviews, either. Currently, it is more important and effective to have Google reviews than say Yelp reviews. The reviews from site outside of Google are helpful none-the-less, but Google will be more influential, plus provide local SEO. At Tempo, we offer a service called review tracking. This service will contact your customers for you and encourage them to leave great reviews on Google, Facebook, Yelp, and other websites. This is a great and valuable service because reviews drive decisions. Just think about all the times you use reviews to make your decisions; Amazon, hotels, restaurants. Like I said earlier, word-of-mouth is still important, but reviews combine this benefit with digital marketing. It’s the best of both worlds. I could go on about the importance of local businesses having local optimization to get local customers. The bottom line is simple: you need to actively build a local presence. Simply having a website is not enough anymore. You can follow the steps above to start your local SEO journey, or you can work with Tempo Marketing to handle all of this work for you. Be aware that this process is a complicated one that takes time and months to take effect. It’s a long-term strategy, not a short-term fix. If you’re local, be local – and make sure Google knows who you are. That’s the only way your customers will find you. 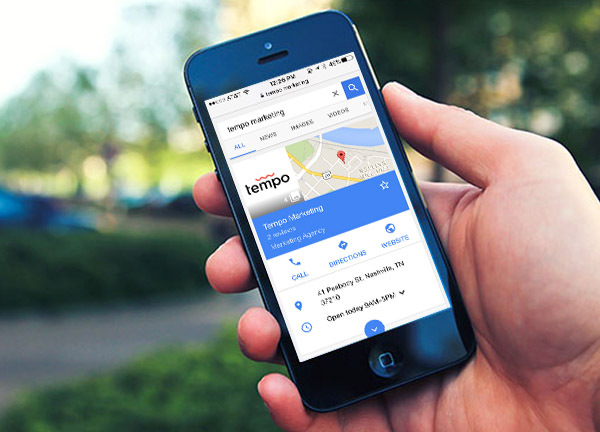 Contact Tempo Marketing today to learn more about local optimization for your business.